THAT animated cartoons have come to stay as an important factor in motion picture entertainment is a recognized fact. During the past few years, in one form or another, they have been given a place on most of the larger programs, and artists of repute in the magazine and newspaper field have been attracted by the new opportunities. If it is true that the advancements made in the production of photoplays have been due to the combined efforts of a great number of producers, each, in turn, contributing a valuable innovation, it is equally true that the animated cartoon, as an artistically and commercially feasible form of screen entertainment owes its existence to one man  J. R. Bray, formerly with Pathe, and now allied with the Paramount Corporation. Mr. Bray had won his spurs as a cartoonist long before he dreamed of giving his figures animation and causing them to move across the screen. At the time has was drawing the Teddy Bear series for Judge, motion pictures were giving evidence of becoming the national amusement, and Mr. Bray conceived the idea of adapting his art to the new form. If people enjoyed humorous drawings without action, how much more would they enjoy humorous drawings combined with action? He promptly began to experiment; he learned all the technicalities of photography; he spent considerable time at the Bronx Zoo studying the movements of animals that his drawings might be natural, and as the result of six years expended in perfecting a process he devised a workable method of making an animated cartoon. Since 1912 his Heeza Liar and Police Dog series have brought laughter and applause in countless theaters. Thus far, at least, his productions have been inimitable. Mr. Bray showed gratification in speaking of the organization he is directing in the Bray Studios, Inc. an organization of artists and distinctly for the benefit of artists gifted with the peculiar form of imagination and talent needed in this work. With C. Allan Gilbert as an associate, he soon will be ready to introduce a style of drawing that is heralded as revolutionary; and apart from this, he is looking forward to big results from the staff of artists now under his direction. I find that most people have an entirely mistaken notion about the qualifications demanded in making animated cartoons, Mr. Bray continued. They think the chief requisite is patience in tracing hundreds of drawings, when in reality one must possess imagination combined with an exact knowledge of motion. During the past few weeks I have tried out more than a dozen men who have been successful as cartoonists or illustrators, and the majority of them have been all at sea when it came to utting action into a picture. Take such a simple thing as a cat jumping from a table. We all have a vague idea of how the cat appears, of the position of the legs and the tail; but when it comes to giving the idea exact expression on paper we find how hazy our knowledge of motion really is. In preparing an animated cartoon an artist must depend largely upon his imagination, for, of course, there cannot be a model for each movement. Mr. Bray said that the five well-known artists now associated with him in the studio have revealed an exceptional aptitude for this difficult work. They are L. M. Glackens, C. T. Anderson, Earl Herd, Paul Terry and Leighton Budd. Referring to suits brought for the protection of the process used in the making and photographing of the pictures, Mr. Bray said that there was danger of his motive in instituting the litigation being misconstrued. He said that he never had any wish to exert a monopoly by driving other artists out of the business. Quite the reverse; he has done all that he could in fighting the battle of the artist byinsisting that he receive a just payment for his work. Mr. Bray feels that two dollars a foot for negative is not too much in consideration of the time, expert knowledge and labor expended. From the first, he continued, I have tried to uphold the dignity of the animated cartoon and in doing this I have naturally opposed the circulation of poor work, that would give the public and exhibitors a wrong impression of the type of picture in which I was interested. Some of the film released was so entirely without merit that it harmed the business prospects of all artists engaged in making cartoon drawings. Since his first subjects were issued by Pathe, Mr. Bray has brought about many improvements in the process of preparing the pictures and treating the film. The white background originally used was found to be unsatisfactory because it became badly scratched after a few weeks war. Amber and sepia tints were used with better results; but now a method has been perfected whereby the film may be thoroughly toned. This innovation probably will be used to good purpose in the pictures being made by Mr. Bray and Mr. Gilbert. The Silhouette Fantasies, as they are called, promise a brand new sensation for photoplay patrons and it may not be very long before exhibitors are offered a five-reel photoplay drawn by Mr. Bray and his associates. 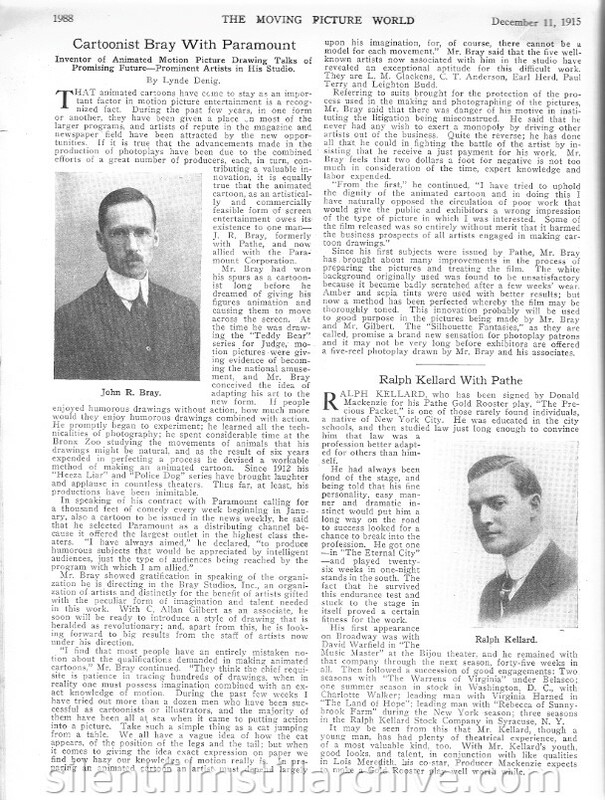 From The Moving Picture World, December 11, 1915, page 1988.